Paper Crafts by Candace: Two of my Favorite Things.. Pink by Design and The Greeting Farm!!! This chick is Ebony from The Greeting Farm, I just got her in the mail and had to put her on a card ASAP. I also just got my lace background stamp from Pink by Design (which is on sale right now for $11.99!!) and thought the two would go perfectly together. The sentiment "Just a Note" is from Pink by Design "Scripted Year". I also used a Martha Stewart border punch for the black and teal portion at the bottom. Make sure to come back on Friday, it's Design Team day over at Pink Cricut!! Adorable! I love TGF stamps. of course its super cute girlfriend !!!! 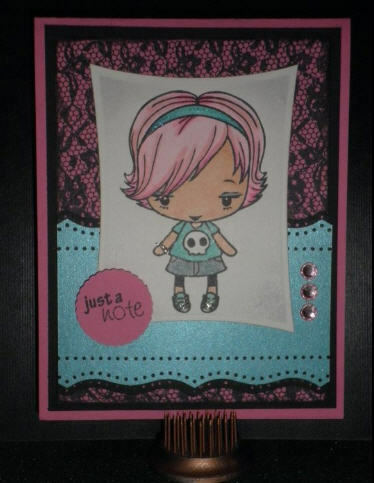 She's adorable, love the background stamp, cute card! That is so adorable! Love the stamps and color combo!